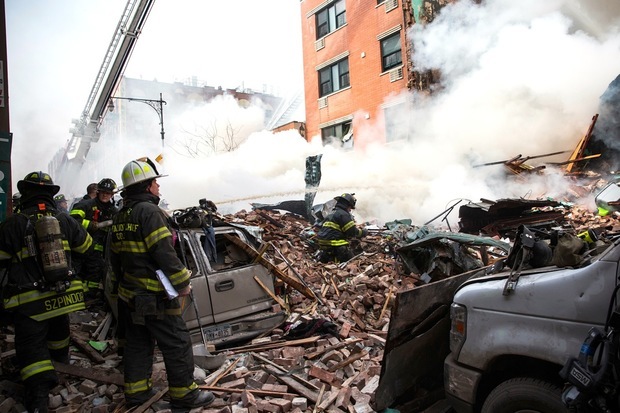 EAST HARLEM — The city could be facing more than $1 billion in payouts after an East Harlem explosion that demolished two buildings, killed eight people and displaced hundreds in March. The city Comptroller's Office has received 205 notifications that people intend to sue for things ranging from wrongful death to property damage. They've been filed by people including family members of the eight victims, first responders who were injured during rescue attempts and many more who were involved in the March 12 explosion at 1644 and 1646 Park Ave. Even Con Edison, which owns the 100-year-old gas lines under the building, filed a notice stating that, "third parties may assume we are responsible." The claim was filed as a precaution, a spokesman said. For many victims of the explosion, recovery includes surgery, counseling and dealing with post traumatic stress. Lisbeth Perez said the blast that killed her husband, Andreas Panagopoulos, upended her life. Robert Vilensky, a lawyer representing roughly 10 people hurt in the explosion, said his clients face problems ranging from hearing loss to torn ligaments to anxiety disorders. Vilensky expects most if not all his filings to end up in court. He also plans to sue Con Edison for failing to maintain the gas lines and the owner of the building for neglecting its upkeep. Because of the high number of claims, many of them will most likely be consolidated and tried before one judge, Vilensky added. Each claim tells a story of what happened around 9:30 a.m. on March 12. Miguel Vizcano was driving an ambulance with two passengers when he stopped for a red light on 116th Street and Park Avenue shortly before the explosion. The blast shattered the ambulance’s windows and left Vizcano and his passengers trapped for several minutes, according to a notice of claim. James Lesane, who filed a lawsuit against the city in New York State Supreme Court in October, was walking on 117th Street. Despite being temporarily blinded, he tried to clear people from the area. Lesane saw people being crushed and trapped in cars. He has since developed post traumatic stress. "He was trying to help," his lawyer Younie Choi said. "You can imagine being in the middle of the street and seeing not only that blast but the people." Lesane's lawsuit also names Con Edison and the owners of the building. Firefighter Dale Scott was doing a search and rescue mission after the explosion when the floor collapsed under him. In the fall, he tore his rotator cuff and multiple tendons. He also hurt his hip. Many lawyers are waiting for the National Transportation Safety Board’s final report to come out. Although the federal agency finished its on-site testing, its full report on the cause of the blast has not been completed, spokesman Eric Weiss said. Preliminary tests suggested that the blast was caused by a natural gas leak. “There is not too much going on. We are waiting for the report to come back,” said Michael Huerta, a lawyer representing close to 20 people affected by the blast. Perez knows that no amount of money from a lawsuit will bring her husband back. She just wants to hold institutions accountable, she said. After the explosion she turned to a strong support group of friends and family, including Panagopoulos' family in Greece. She has since found a new apartment and continued to work as an editor for El Diario. Her life has become a tribute to her husband. “Andreas was a very happy man and a good man that loved life and loved living and I know that he would want that for me," she said.